One set of Bactec Culture Bottles (1 aerobic and 1 anaerobic) and 1 Yellow Stopper Top Tube are used for each Fluid Culture ordered. 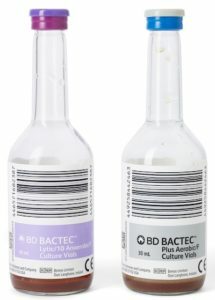 Disinfect the Bactec Culture Bottles by wiping the tops of the bottles with a 70% Alcohol Prep Pad and leaving the pad on top of the bottle until ready to inoculate. Attach Safety Needle to Holder. Remove green needle cover and insert needle into medication port. Insert the top of the aerobic Bactec Culture Bottle into the Holder. This will pierce the stopper and allow the bottle to automatically fill. Allow fluid to fill until 10 mL collects. Remove the anaerobic Bactec Culture Bottle from the Holder. Insert the top of the anaerobic Bactec Culture Bottle into the Holder (you may use the same Holder). Insert the stopper of the Yellow Stopper Top Tube into the Holder. This will pierce the stopper and allow the tube to automatically fill (one tube per test ordered). Use the bar code labels with patient’s name and ID to identify each Bactec Culture Bottle and the Yellow Stopper Top Tube. Note: Do not place the patient’s bar code label over the bottle’s bar code label.